Grilled Corn - Great corn recipe for picnics! Peel back corn husks but leave attached at the bottom of the ear. Remove silk. Mix spices with melted butter and brush on corn. Pull husks back up to cover the ear of corn. Place ears on grill over medium heat. Grill 30 minutes, turning every 5 minutes. Remove husks and serve immediately. 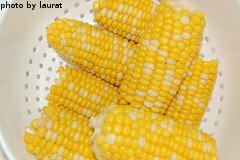 Corn Salad - An excellent raw corn recipe! Blend sour cream, mayonnaise and vinegar together in a small bowl. Add salt, black pepper, red pepper and celery seed and mix together. In a separate serving bowl, combine corn, cucumber, bell pepper, red onions and tomatoes. Pour sour cream mixture over the vegetables and toss to coat. Refrigerate salad for 3 hours before serving. Creamed Corn - One of several classic corn recipes! In a blender or food processor, puree 5 cups corn with milk, half and half, salt, pepper and garlic powder. Pour mixture into large sauce pan. Stir in remaining 5 cups of corn and sugar. Cover and simmer over medium-low heat for 30 minutes, stirring frequently. Serve hot. Add water to a large pot and bring to a boil. Add potatoes, carrots, celery, onion, bell pepper, salt, black pepper and garlic powder. Reduce heat, cover and simmer 20 minutes. Add in corn and simmer another 15 minutes until potatoes and carrots are softened. Add milk and half and half to vegetables and reduce heat to low. Heat through. Add in cheese and cover until cheese is melted. Stir again and serve immediately. Blanch corn in hot water for 3 minutes. Immediately plunge into ice water. When cool, cut corn from cob. Place kernels in serving bowl. Add in remaining ingredients and combine thoroughly. Cover with plastic wrap and chill in refrigerator for several hours or overnight.